Skin Cancer is the most common cancer and it has been studied that one out of two persons in America and Australia develops skin cancer in their lifetime. There are three types of skin cancers which have their specific signs and symptoms. Now the question before us is to control and treat this most common type of cancer and following are some of the methods by which we can treat skin cancer. Skin cancer treatment is known as actinic keratoses. It may be treated by using some surgical operations or by using other methods of treating skin cancer. 1. 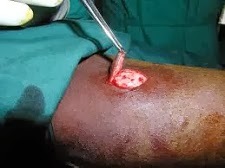 Excision :- It is a surgical treatment in which the tumor is cut down by making the skin numb by the dermatologist. It is a very simple and easy method of treatment. Wounds are healed without stitches. 2. Electrodesication and curettage :- This is also a surgical process which is adopted to treat cancer on superficial layer of skin such as small basal cell or squamous cell skin cancers. In this the affected skin is scrapped with curette and if there are more cancerous cells left then they are burned with electric needle. 3. Mohs treatment or surgery :- As the name suggests it is a surgical treatment in which a specialized dermatologist treats the patient by removing layer by layer of the affected skin area. This treatment is used when there is difficulty in locating the skin cancer. It has very high rates of success. 4. Cyrosurgery or freezing :- In this the doctor or dermatologists freezes the affected skin area with liquid nitrogen which destroys the affected area and the cancer cells are removed. 5. Immunotherapy and chemotherapy :- In immunotherapy body of a patient is treated in such a way that its own body fights with the cancer cells. In chemotherapy several medicines & ointments are used to treat the skin cancer. The medicine generally used for treatment of skin cancer is 5-fluorouracil or 5-FU which is applied on affected area and it destroys that affected area and instead of that new skin appears. Several drugs are also taken to destroy cancer cells but along with cancer cells some normal cells are also destroyed. It results in side effects such as hair loss, weakness and vomiting. 6. Photo-dynamic therapy :- It is done in two phases. Firstly a chemical is applied on skin and kept for several hours and then this is exposed to a certain light which destroys cancer cells. 7. Radiation therapy :- It is the least recommended treatment for skin and done in case where the skin cancer covers a major area and it is hard to do surgery. It is recommended for patients of old age. There is a risk for developing other type of skin cancer.